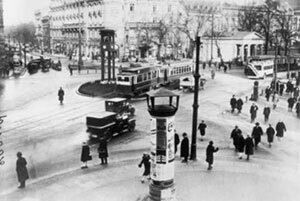 I will be joining the Milwaukee Laptop Orchestra (MiLO) in performing an improvised soundtrack to Walter Ruttman’s 1926 silent masterpiece, Berlin: Symphony of a Great City, Thursday, October 18, 2007, 7:00 PM, UWM Union Theatre, free admission. This entry was posted in ensembles, group performances, sound, sound for silent film and tagged MiLO, Milwaukee, silent film, UWM, UWM Union Theatre, Walter Ruttman by glenncbach. Bookmark the permalink.